Posted on 07/17/2012 by Stand and face the sun. The largest land animal has a lot to teach us. Posted on 07/06/2012 by Stand and face the sun. I have always had a thing for elephants, yet I have never met one personally. Sadly, I worry I never will, but that’s for another time. I have read many books about elephants, where they are the lead character. One of my favorites is Modoc, by Ralph Hefler. I shall share a list with you at the end of this of all the great many elephant stories I have read for all the elephant fanatics like myself. Once I started practicing yoga, I found it comforting that in the mythology of yoga there is a character named Ganesha. Ganesha is an elephant headed figure considered to be very sacred amongst yoga practitioners. Which, for me, was a good thing because it made picking my Ishta Devata very easy. What is an Ishta Devata, you might ask? It’s something that you resonate with. But by definition it is a “cherished divinity”. It might be an energy that you devote your practice to (Bhakti yoga), or it could be described as a force that makes you calm and steadfastness in your direction. It could be a feeling that you do not doubt. I have never doubted that an elephant head God-like figure wouldn’t be a good match for me. I find elephants to be exquisite in their beauty, impressive in their grace (even though appearing outwardly clumsy). They show great empathy in their family network and they exemplify what a support system should look like. They seem to embody the ability to grieve and they are pregnant for 22 months. So they must be amazingly strong, wouldn’t you say? In the mythological symbolism of the Great Ganesha, he is considered the deity of choosing for removing all obstacles. He is a great archetype to honor at the beginning of all new endeavors to help assure that your path will be obstacle free. However, I prefer to think of Ganesha as a source of strength that I can go to, to overcome my obstacles. I do not like the notion of removing obstacles because I strongly believe it is the obstacles I have met and overcome that have shaped me into the resilient person I am today. Obstacles require creative thinking. Obstacles make our travels less linear and more meandering. It’s the terrain of life that gives our journey shape, the up’s and down’s, in’s and out’s, and the back and forth. To share with you a truth about linear travel, I can tell you this: I live where it is very flat and many roads tend to be very straight. Nothing feels more exhilarating then when I get into the mountains a few hours away. The curving, climbing, wrapping, and descending shapes of the road and the scenery that goes along with it always takes my breath away. Roads like that seem to bring out my adventurous spirit. If all my obstacles were removed wouldn’t that make my journey easy and uneventful? If the troubles that lie ahead were taken away for the sake of my comfort, what would I appreciate? It’s usually in the uncomfortable places that I find myself most alive and even willing to be daring. Being comfortable sets up the likelihood that I might become dull (styana). Dullness isn’t exactly a label I’d like to wear. I don’t know about you. 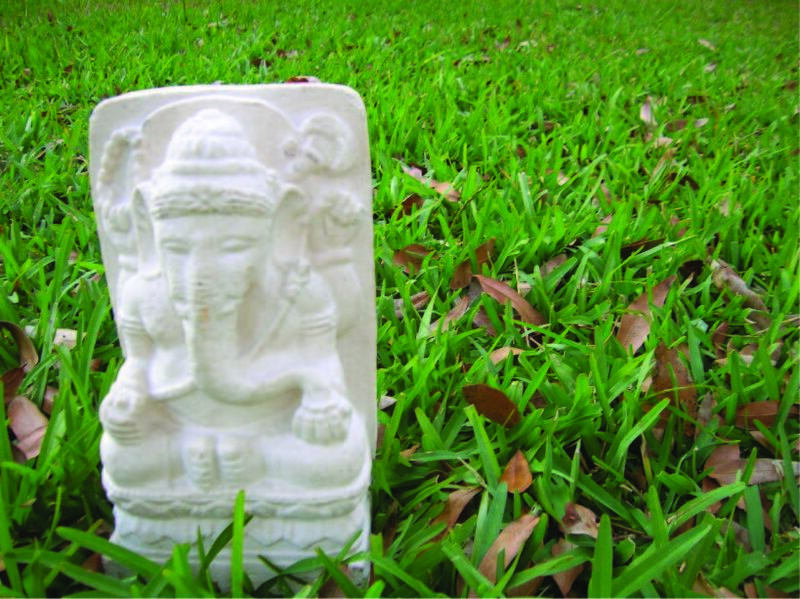 I align myself with Ganesha when standing face to face with an obstacle. I take strength from this Divinity because Elephants embody so much of what I need. What’s one of the first things you might need when facing a obstacle? Family, friends, right? Elephants live in great family structures that are very loving, supportive and even adoptive at times of loss. They set up a system of what’s called allomothers, whose job it is to look after the young calf and help it along. I need people around me, that support me, and help me along when I’m facing an obstacle. Don’t you? What else do Elephants have that might inspire me during times of challenge? They have thick skin, hence the name Pachyderm. This thick skin is why they have no true predators,except for humans. :-[ The only time you will see an elephant down is from illness, age or humans. When I am confronted with difficulties, it is no time to become thin-skinned. It’s time to toughen up. Of course, one of the most apparent traits of strength comes from the fact that they are sturdy creatures, not easily knocked down. Matter of fact, they seldom lie down at all. They need almost 22 hours a day to feed themselves to keep up their energy for their 600 mile migration during the dry season. There is no time for the weary. They can travel many miles on their four sturdy legs. Elephants have to constantly stay on the move for food and water, for the sake of survival. When I’m facing a challenge its necessary to keep moving forward. It’s time to keep up my energy with things like yoga, a good diet, and people around me that will encourage me. Staying in one place creates stagnation – movement is the answer. Now their most charming physical attribute is of course their trunk. How could I possibly see inspiration from their trunks? Their trunk is a great representation of strength and flexibility. Their trunks are sensitive enough to pick up a single blade of grass or strong enough to break the branches off a tree. Like sutra 46 chapter 2 says “Sthira sukham asanam” You should be at ease and steady in your asanas. Learning to be strong and flexible is about becoming balanced between opposites (dwandwa)? Their trunks can be very delicate because it has over 150,000 separate muscles fascicles, it is also highly innervated making it extremely sensitive. It is said, in the yoga tradition, that the human body has over 72,000 nadi’s (or little rivers, energy pathways) that act as our information highway. In order to keep our nadi’s functioning well we need to become aware of bad energy in our body which would create an energetic traffic jam of sorts. We need to stay sensitive when facing obstacles and yoga is great way to do that. Then of course there is their form of communication. They communicate mostly at a pitch that we humans can not hear. Even they aren’t really hearing it. They are FEELing it. Their feet are designed in such a way that they are able to feel vibrations traveling miles to them through the ground. The sensitivity that they have in their feet and trunk allows them to communicate miles apart and at times reunite a family group that had gotten separated. This communication allows them to survive some pretty challenging conditions. But the most amazing thing about this type of communication is that it requires great sensitivity. It requires that they feel information instead of seeing it, or hearing it. The human species is far to dependent on sight and sound. So much so, that we love to hear the sound of ourselves speaking and to see ourselves in a mirror. Instead we should trust what we feel. Our gut instinct can be a great resource in time of difficulty. It’s this sensitivity that will allow our decision-making through difficult times to be less reactive and more responsive. Sensitivity can be refined when practicing an OM. Try to feel it, instead of hear it. Sutra 30 Chapter 1 describes everything that an elephant is not. “Vyadhi styana samsaya pramada alasya avirati bhrantidarsana alabdhabhumikatva anavasthitatvani citta viksepah te antarayah.” Translated – The obstacles that distract the mind are illness, dullness, doubt, carelessness, laziness, overindulgence, illusions about one’s self, lack of perseverance and instability. Sri Swami Satchidananda interpreted this sutra as such ” Remember, yoga practice is like an obstacle race; many obstructions are purposely put on the way for us to pass through. They are there to make us understand and express our own capacities. We all have the strength but we don’t seem to know it. We seem to need to be challenged and tested in order to understand our own capacities. In fact, that is the natural law. If a river flows easily, the water in the river does not express its power. But once you put an obstacle to the flow by constructing a dam, then you can see its strength in the form of tremendous power. I look to elephants, all shapes and sizes, fact and fiction to guide me through my obstacles and to overcome difficulties. I go to Ganesha for strength and wisdom. I am reminded by the great elephants that we are here to help each other along, like elephants do in their herds. Horton from Dr. Seuss said “A person is a person, no matter how small.” We are all trying to get over different obstacles, at different times, and of course from different places. Let’s just remember “I meant what I said and I said what I meant. An elephant is faithful 100%.” – Dr. Seuss. We could all use a trunk to hold on to, sturdy legs to stand on, thick skin to cope, sensitivity we trust, and a family to count on. Let’s be inspired by Elephants and remember to pay homage to Ganesha.